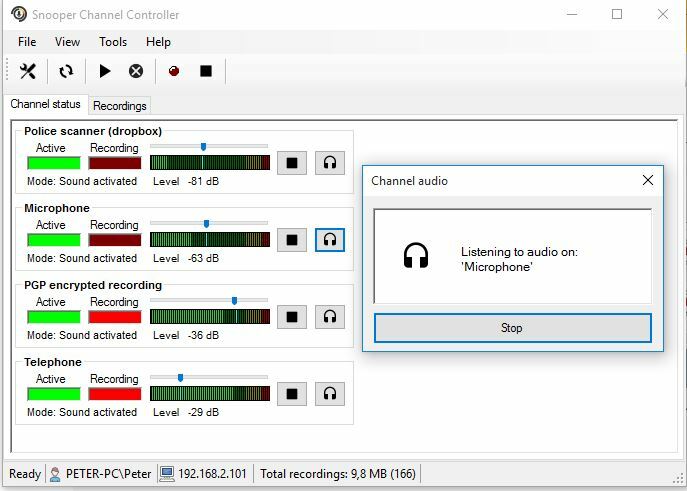 Snooper Multi Channel Recorder is an advanced system that can record sounds from multiple audio channels simultaneously. The system can be configured to record up to 32 channels simultaneously on one computer. Each channel is powered by a Snooper Professional instance running in its own process that can be started as a Windows service. This makes the system very flexible and extremely robust. You can easily setup one channel to PGP encrypt the recordings and another channel to run on a daily schedule and zip-compress and send the result to Dropbox. All channels can be supervised and maintained by the Snooper Channel Controller application. Every channel has all the features of the Snooper Professional program. Record up to 32 channels on one computer. Search recordings by date and channel. Configure each channel separately according to Snooper Pro settings. Run each channel as a Windows service that will startup accordingly when rebooting. Monitor of live audio from connected channels directly from the Snooper Channel Controller application. Password protect vital functions of the Snooper Channel Controller. Very robust, every channel is running in its own separate process. Easily search, edit and manage recordings from within the Snooper Channel Controller application. Possible for IT-departments to receive alert messages if error occurs or a channel goes down. Download Snooper Multi Channel for a free session based trial! Windows 7/8 or Windows 10. Internet connection for email, FTP, Dropbox etc.